Desenzano del Garda is the largest Italian city located on Lake Garda. This resort town is the center of the lake navigation, all the ferries come here, this is where you can stroll along the long promenade, along the wide central street, visiting a large variety of shops on the way, relaxing in the best restaurants and cafeterias. 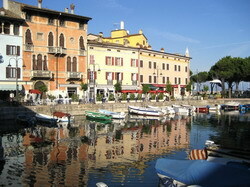 The unique location of Desenzano is undoubted merit of the city: it offers a wonderful view of the lake in its full length. In addition, the city can be proud of the closeness to the major arteries of communication that allow the tourists to see the sights of the Verona coast and the Brescia coast. When planning to spend a holiday in Desenzano del Garda, be sure to contact our company and order a transfer to the hotel in Desenzano. We will offer you a comfortable car and affordable prices. We will also help you to get from Desenzano del Garda to the airport, thus you will come just in time to the airport without hustle and bustle, keeping good impressions about this wonderful city.